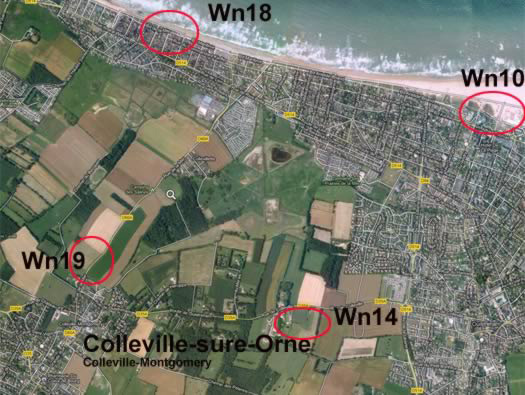 Wn19 Colleville-sur-Orne (nord), K.V.U.Gr Riva-Bella, K.V.Gr Caen. Situated just back from the beach. 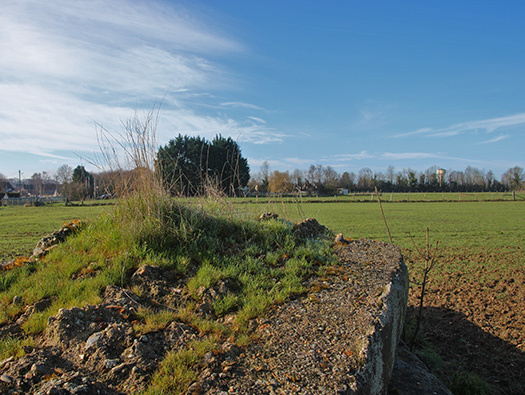 Wn19 was situated north of Colleville-sur-Orne and today there is very little remaining. 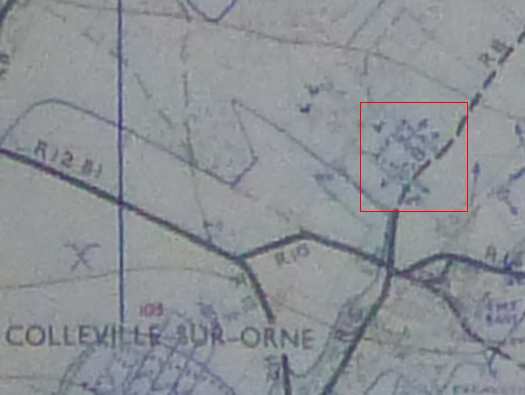 It looks as though it was set into a hedge row and the white marks left could be the two Tobruk's were?? 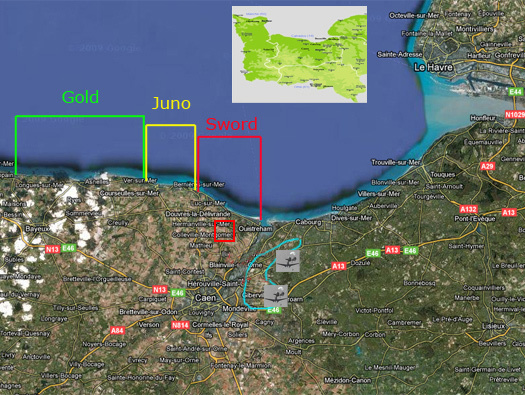 Its a slightly longer Tobruk than normal? 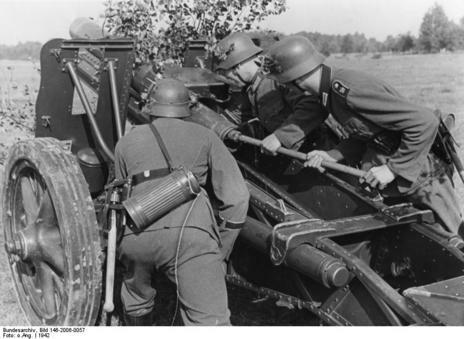 It may be a Bf67neu? To me this looks like a hurriedly made Tobruk. Its longer than it should be and is not finished off as most Tobruks were. 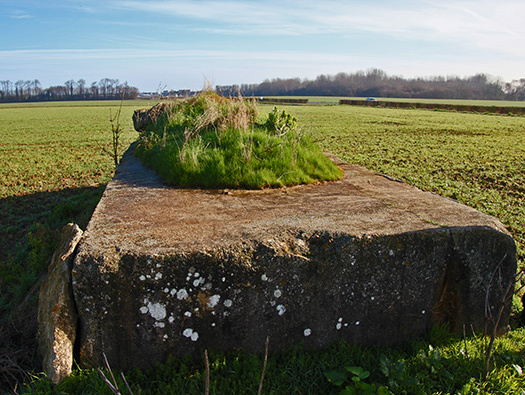 Showing up as the field with surrounding trees.. 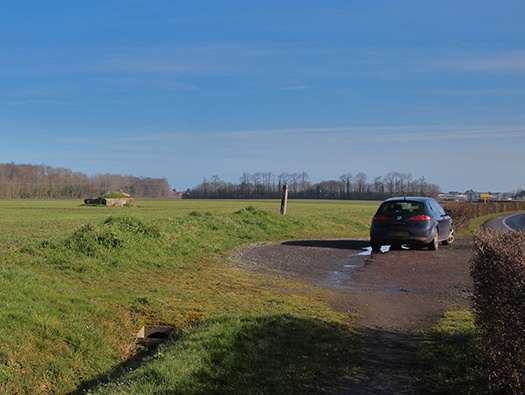 The countryside has changed a lot, fields are larger and hedgerows removed. Suddenly the column came to a halt. I pushed my way up a little lane with high hedgerows on either side and came to a gap where the hedge had been broken. On the far side of the gap a clump of bushes and there I saw my Second-in-Command. His face was a mass of blood. He had been hit by a grenade. 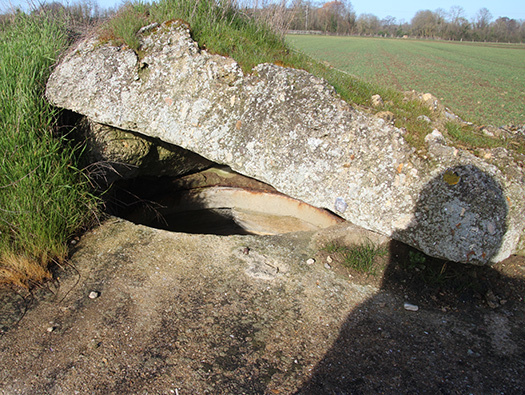 He was in a shocking mess; knowing that speed was essential he had gallantly tried to rush a pillbox and received a stick grenade in the face. Somehow this had to be sorted out really quickly. There was no possibility of an alternative approach without running into more trouble. A wireless message came from Lord Lovat: 'Why are you halted?' The rest of the brigade, it must be remembered, was following in our tracks. It was our job t blaze a trail. 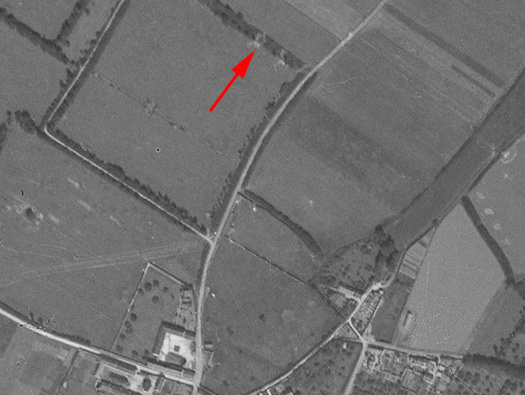 About seventy yards away on the right I saw a British D.D. tank, which had come straight up a track from the beach. 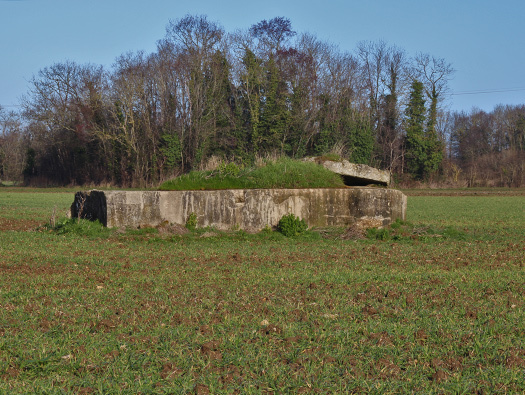 It lumbered forward and fired two rounds; the first on did no damage, but the second one split the pillbox like a rotten apple. Now this action could have happened here?? 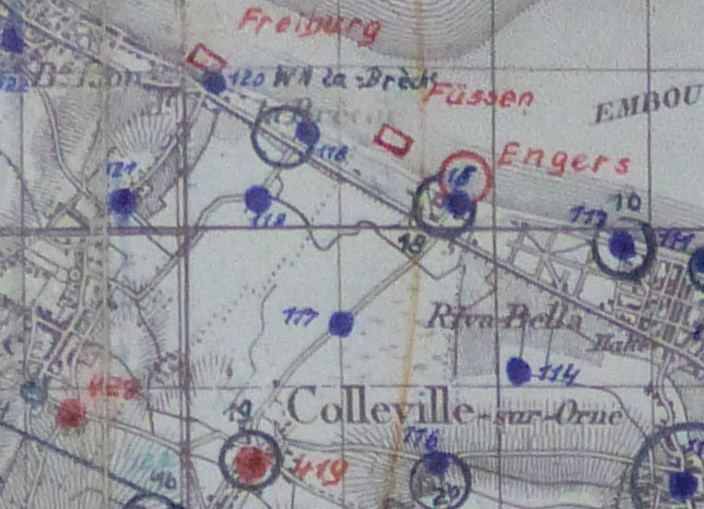 The German artillery fire plan for Wn19 actually marked on the plan. Also the names 'Feiburg', 'Füssen' & 'Engers' are the fire targets for beach drenching if the beach is attacked as it was on D-Day. 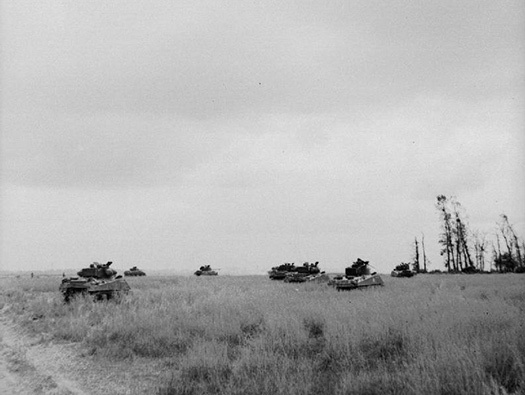 British Sherman's attacking near Evrecy.